Everything you’ll need was purchased from Amazon.com, Lowes, and Ikea. If you do not have a Lowes near by you should be able to find most everything at a local hardware store, except maybe the Aluminum flat bars. You don’t need to follow everything I have done to a T, instead use this tutorial as a guide line and adjust as you go depending on your own tastes and needs. Please be sure to send any comments/ corrections/ thoughts or comments, so we can make sure this tutorial stays up to date and includes only the most helpful information! This is for the desk itself. Also included is the chair I picked out, and a little side cabinet which is not required for this build, but works out well. Now that you have a shopping list to work with, it’s time to build everything! You should make sure to adjust the hinged door at the top-back of the desk, so there is a nice gap between it and the desktop once closed. This will let you run cables out from inside the desk, without pinching them! I did NOT end up cutting my aluminum bars to length, instead I used them at their stock 8’ lengths. 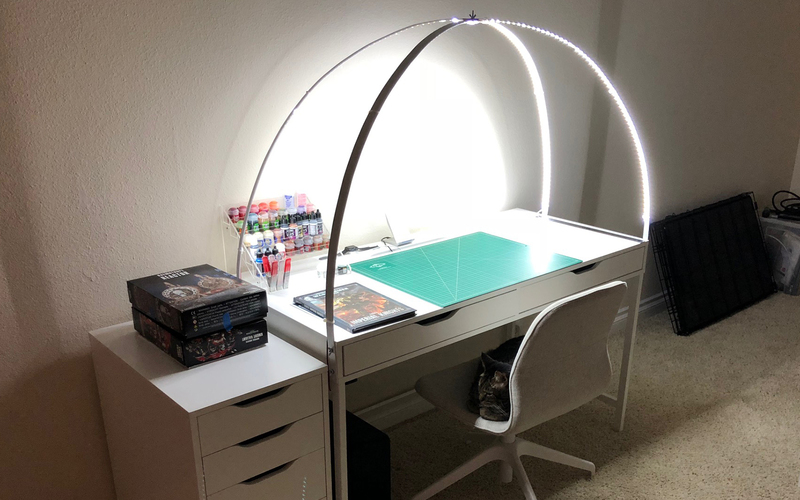 The way my light arch is assembled there is just under 28” of vertical space from the peak of the arch, down to the desk top. 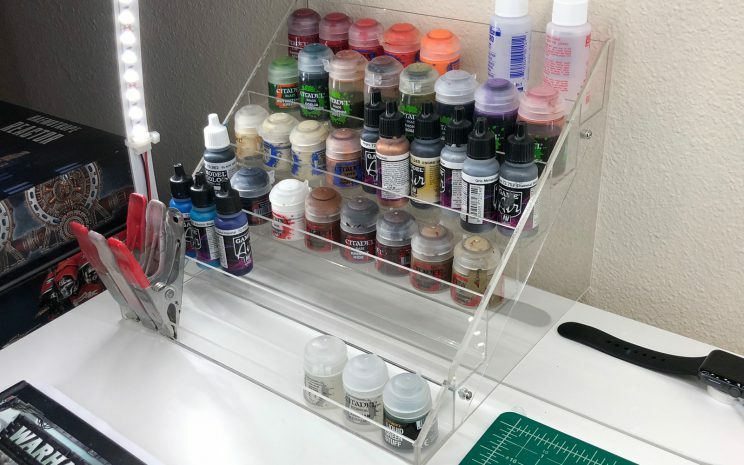 After putting it together I realized that it’s much taller than it needed to be, but by that time I had already drilled the holes and painted it! If you’d like to make the peak of the arch shorter, remember that each far end of 4-1/2” of the bars will be mounted flush to the SIDES of the desk! You will need to drill 5 holes into each bar of aluminum. One hole in the middle of the arch, so both arches can be bolted together, and 2 holes on either end of the bar so that they can be bolted to the desk. The middle hole is easy, as you take your overall bar length and divide it in two. The holes on the far ends of the bars and are only slightly more difficult to figure out. You will need to drill one hole 1 1/4” away from the end of the bar, and another hole at 3 ½” up from the end of the bar. Repeat this on all 4 bar ends. All holes should be centered on the bars width. For the aluminum bars, I used a slightly oversized drill bit (1/4”), this way in case the drill bit walked around on the surface before biting, I wouldn’t run into issues trying to align them to the holes I would soon be drilling into the desk’s sides. Alternatively, use a center punch! Lay the bar down on the ground. I placed my foot in the center, and pulled up on the bar every few inches, gingerly working your way from one end of the bar to the other to essentially add 10’s of tiny bends across the entire length. If you are able to consistently add enough bends the effect will look more like an arch, and less like 100 sharp angles! You don’t need to bend this all in one go, I suggest working your way back and forth a few times to slowly shape the arch. 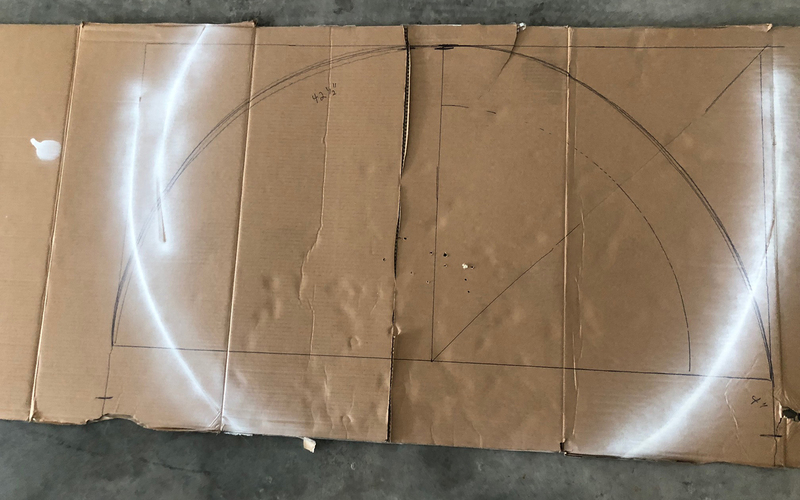 Now that you have something that probably looks less like a perfect arch and more like a question mark, lay it down on top of your cardboard template. Gently and incrementally bend the arch so it matches the template more or less. Once the entire thing is bolted together it will be forced into a pretty nice arch shape anyway, so it does not need to be 100% perfect at this point. Now that you are done bending both bars into arches, hit them with a few coats of paint (If that’s what you’d like to do) I laid mine both down, hit the tops, bottoms, and one side, let it dry for 15 minutes, flipped it and repeated until the white paint covered (somewhat) consistently. I was very impatient and now mine has drips on it. I suggest that you do not follow my path and instead dedicate a window of a few hours to paint up the arches to avoid over applying the paint. Let them sit for a few hours after the last coat is applied. 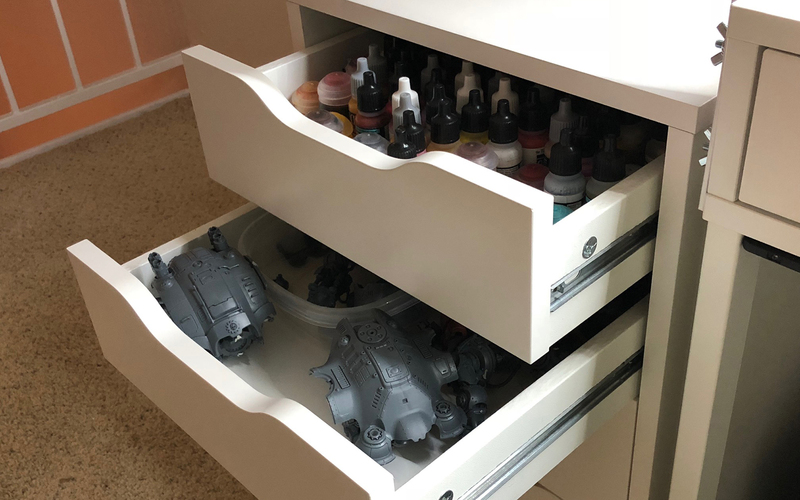 I used a quick dry paint, and it was actually dry within about 15 minutes of the last coat, but I didn’t want me apartment to smell like paint, so I let them air out for about 3 hours. To find where to drill the holes nearest to the FRONT side of the desk, mark one hole 1 1/4” up from the bottom edge of the desk, and another hole 3 ½” up from the bottom edge (see image below). Do the same on the other side of the desk as well. By placing the bolts in these spots, you will avoid interfering with the operation of the drawer slider. 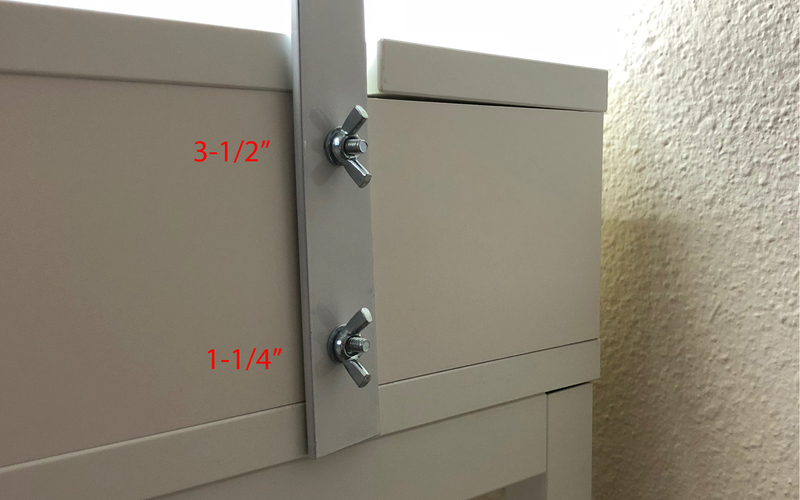 NOTE The way I drilled the holes here means that when the drawer is pushed back into place the front edge will catch ever so slightly on the heads of the screws, this was OK with me because I have cats, and I figured the extra friction holding the drawers in could only be a good thing! 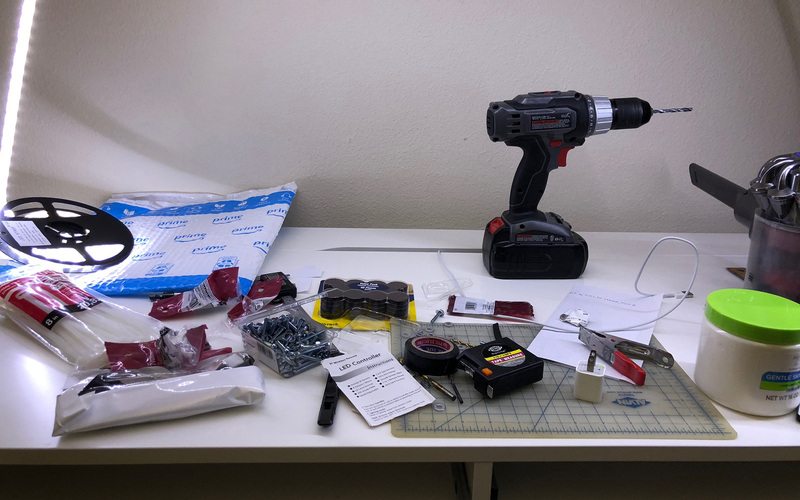 To find where to drill the holes nearest to the REAR side of the desk, mark one hole 1 1/4” up from the bottom edge of the desk, and another hole 3 ½” up from the bottom edge. I made sure to align my holes so the arch would mount just in front of the little flip-up door, this way I could run a cable from the gap in the door right to the arch itself. Do the same on the other side of the desk as well. Pushing the holes in farther from the back side means the arch will not accidentally interfere with the hinged door that hides your power strip and 12V LED Driver. Use a 7/32nd inch drill bit to drill the 8 holes into the sides of the desk. I used this sized drill bit so the machine screws could be pressed through the hole, but have a little friction as well. This stops them from accidentally falling back into the desk when fitting the arch to it. Put 1 washer onto each machine screw, and push the screw in through the inside of the desk, so the threaded ends of the screws are poking outwards. Placing too many washers onto the screw will cause the heads of the screws to interfere with the drawers. Starting with one side of one arch, push both screws through the drilled holes, and screw on a wing nut just enough so it doesn’t fall back off. Bend the opposite end of the arch so it will line up with the pair of holes diagonal to the starting holes (So If you attached the arch on the front-right, attach the opposite end to the back-left) screw on the wing nuts, alternating between which wing nut you are screwing in, until all are snug. Your Arch is now complete, and ready for lighting! 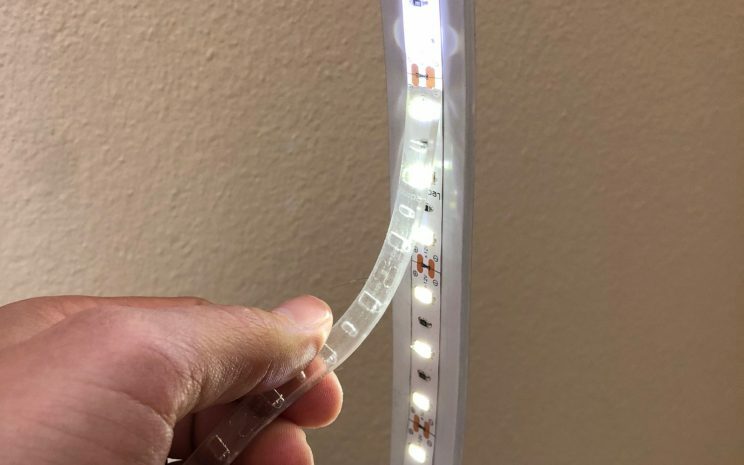 Make sure to test all elements of the light strip prior to putting the whole thing together. If the system works in the beginning, but later on stops working, you will at least know it was something that YOU did, rather than something the manufacturer did! Take the spool of lights out of the static bag it comes in, and also unpack the remote dimmer, and the 12V driver as well. Plug the LED lights (Still on the spool!!!) into the 12V adapter. Then plug the adapter into the wall to check and make sure the light strips actually work! Do not leave them lit while on the spool longer than needed to check that they work though, as the excess heat may damage them! 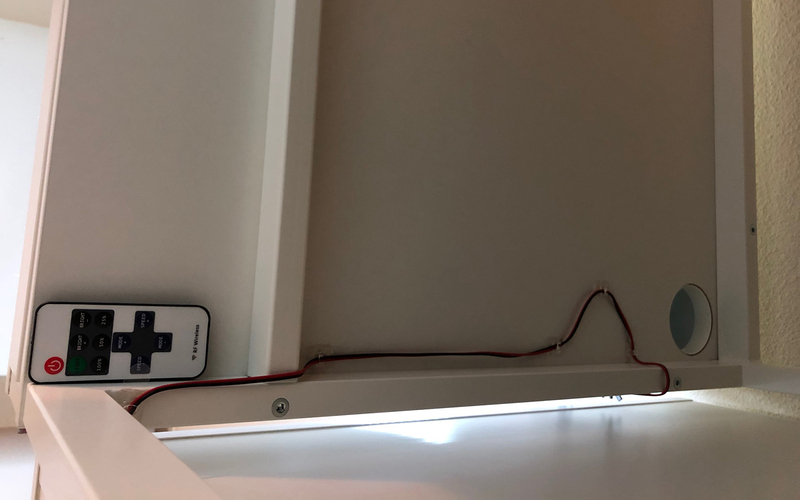 If the LED lights work by themselves, it’s time to test them along with the remote dimmer. Pull the small plastic tab out of the bottom of the remote to allow the battery inside to start working. Plug the lights (Still on the spool) into the remote dimmer adapter, then plug that adapter end into the 12V adapter. Then plug the driver into the wall. Push the red power button on the remote to test the light strip and the remotes functions. You will be able to turn the lights on/off, incrementally adjust the brightness, use preset brightness’s, and also adjust strobe modes and their strobing speeds. 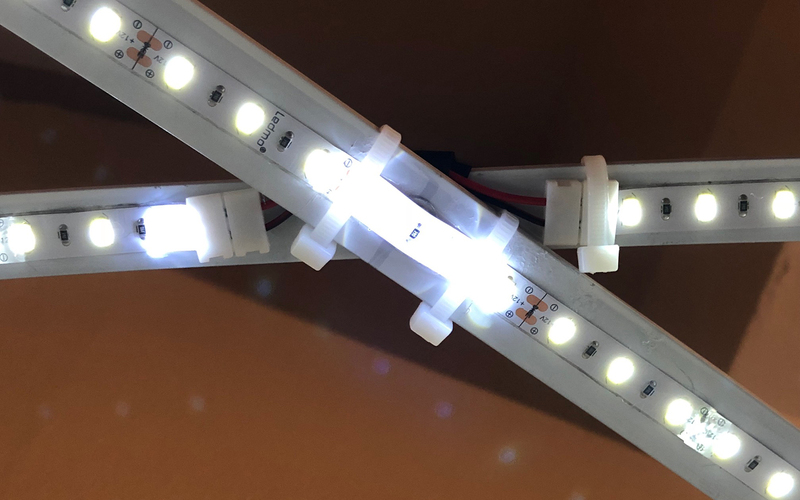 Now that the basic construction of the lights have been tested, it’s time to set them up in order to create the runs that will be mounted to the arches themselves. You will end up with three separate runs of lights. One long run will span one of the arches, while the other two runs will need to have a gap between them, so they can leave a gap where both aluminum bars are mounted together. The light strips are cuttable every 3”, right in the middle of the copper contact points. Cutting them anywhere else will kill that strip segment!!! There is no right or wrong length to cut these to, as the run lengths will depend on how tall you made your arch. Plus some people like to have LESS lights facing towards you when you sit down, since they light the back of the model you can’t see anyway, and shine right in your eyes! I tested my run lengths by using blue masking tape, and taping them into place temporarily every few inches. Although these lights include an adhesive backing, I wanted to save the sticky-ness for when I permanently affixed them into place. I started with the end of the LED strip which includes the power plug. I kept the plug-end at the back-right of the table, this would allow me the connect this strip end right to the driver for power, which is hidden in the back of the desk. Once I had this first strip length figured out, I cut it and moved on to figuring out the other strips. Now that you have 3 runs of LED’s you will need to connect them together! 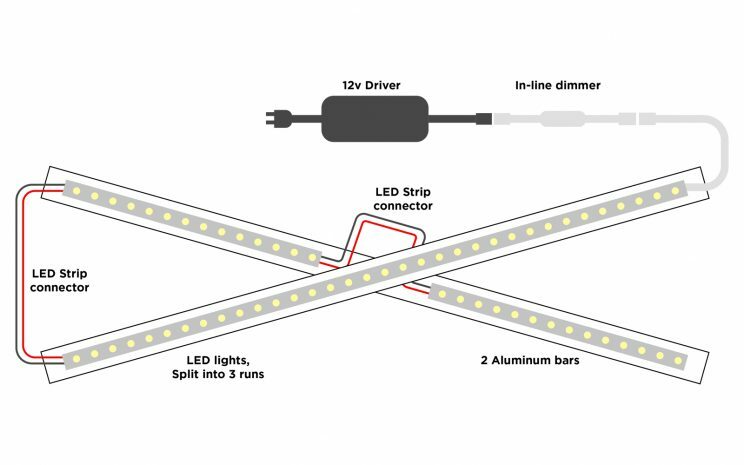 You will use the “LED strip connectors” to connect one run to another. I chose these because I didn’t have a soldering iron with my at the time. You simply snap the ends closed on top of the bare copper contact points in order to link one LED run to another. Note that sometimes they do take a good bit of fiddling with to get right! This is where a multimeter definitely helps! You will need one set of strip connectors to bridge the gap at the peak of the arch, and another one to bridge two arch-bottoms together. Peel the adhesive backed protector off your first LED run, starting with the run that will be applied at the BACK-RIGHT hand side. This way once its plugged in you can momentarily turn your lights on while installing to make sure they work properly. This saved me as I had a lot of issues with connectivity of the middle run I installed, and would not have noticed the problem until everything was installed! Once all lights were installed and tested, I left them turned on as I added a few zip ties here and there to keep them from peeling off. Leaving them on during this helped me make sure I didn’t cause any shorts or accidentally disconnect any wires. I then used the Command Decorating clips to hold any rogue wires in place, like up under the desk. And there you have it! Simple right? Awesome work! I’ve been checking here everyday since I saw your post on Instagram. I will definitely be building some rendition of this. Top notch. Keep it up! Fantastic Rory! Good luck with the build!